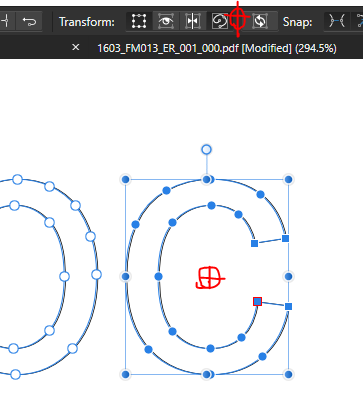 The new Transform Mode of the Node Tool in AD 1.7 is a very welcome feature, thanks for that! Looks like there is the transform Center missing, though, like in the Move Tool. I'm aware that this center would be a temporary, meaning after deselecting the nodes, it will be lost. However, it should be there. Could you put this on the list, please? What do you mean with the transform centre? Maybe the Button to show or hide the rotation centre like in the screenshot below? Talking about the improved Node Tool, not the Move Tool. It's about consistency. I see a transform box, and I expect it to have a center, no matter if I'm in object mode (Move Tool) or component mode (Node Tool). One can ask the opposite question: what sense does it make NOT to be able to rotate or scale about a freely chosen point in point mode?? Also, the transform panel is inactive in that mode. Shouldn't be, either. 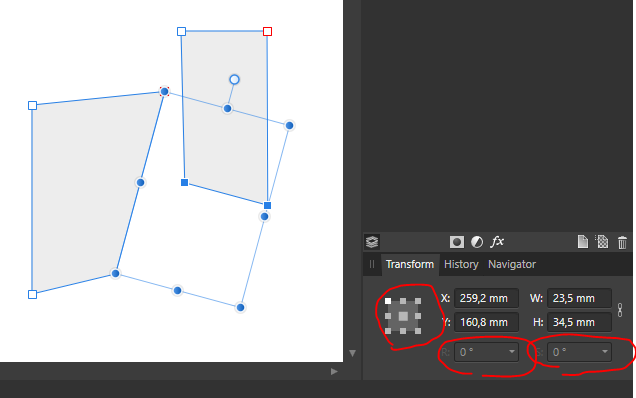 Illustrator can do this - select nodes(points), an there's this "axis icon"/center to place. Any news on that one, or any ambition to implement it? I could use it at the moment. If I get time it'll get done for 1.7.